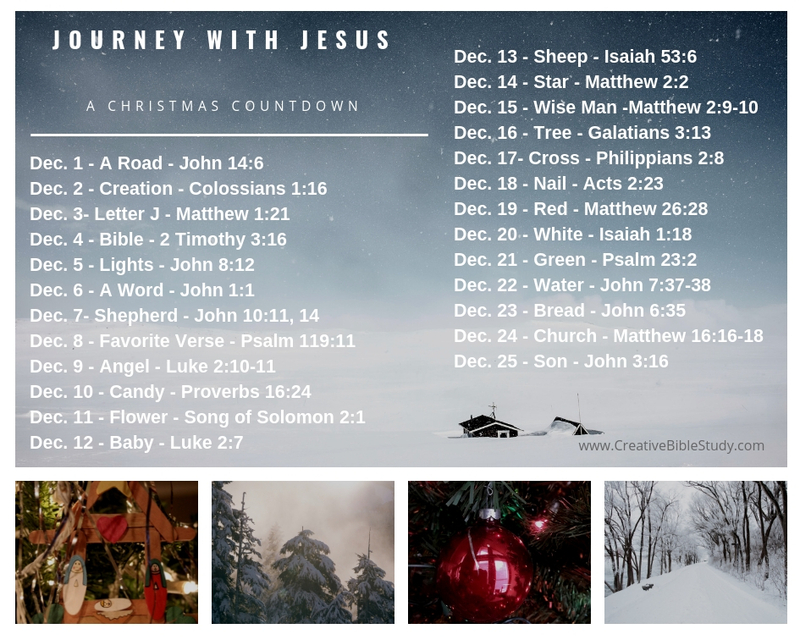 Number 12 Christmas devotion of twenty-five Christmas countdown on-the-go, active, object lesson devotions with Bible verses to help us keep our focus on the true reason for the season! Each day snap a photo of each item for a visual and use as a photo challenge on Social Media, or with your family, small group, friends or just for yourself. It’s a fun way to enjoy the presence of Christ each and every day as we look towards celebrating His birthday! I chose an old photo for today's countdown topic. 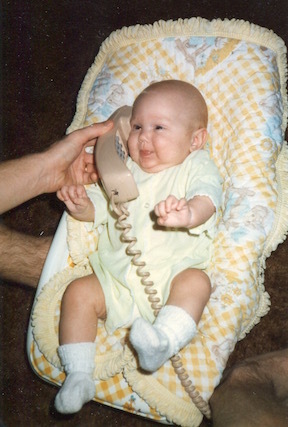 This is a picture of my firstborn...thirty years ago! For me one of the highlights of the Christmas season is remembering and reminiscing. 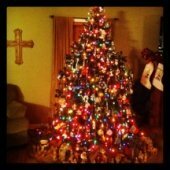 As we decorate our Christmas tree with ornaments from the past, many homemade by our four kids, they bring back sweet memories of long ago Christmases when our children were small. It brings moments of gratefulness and tenderness. Yes, and even some regrets...the "wish I could go back and have a few do-overs". And although we cannot go back, we can gain perspective through remembering. "But Mary treasured up all these things, pondering them in her heart." Mary took time to be still in the moment even with everything going on around her. In the awe of having given birth to God's Son, I believe she took time to ponder and remember Who Jesus was and worshiped. The shepherds had come and were spreading the word the angel had shared with them, and Mary was reminded of The Baby. Just a few days ago I attended our Ladies' annual Christmas Brunch where our speaker reminded us - "Don't forget the Baby." In the craziness and hustle and bustle of all that is going on around us, don't miss worshiping the Baby. This Child born in a lowly manger giving access to anyone who will come to Him. Had He been born in a palace as the Prince and King of Kings He was, very few could have come and worshiped. Even if He had been born in the inn, I doubt the shepherds would have been welcome in with their stench from being out with the sheep. So in God's great wisdom, not by chance, there had been no room in the inn; Mary and Joseph had taken the only shelter offered to them - the stable...with the animals. God made Baby Jesus accessible both in His birth and in His sacrifice on the cross. Let's ponder God's great love this Christmas. Let's make room for the Baby (Jesus) in the inn of our hearts and worship!